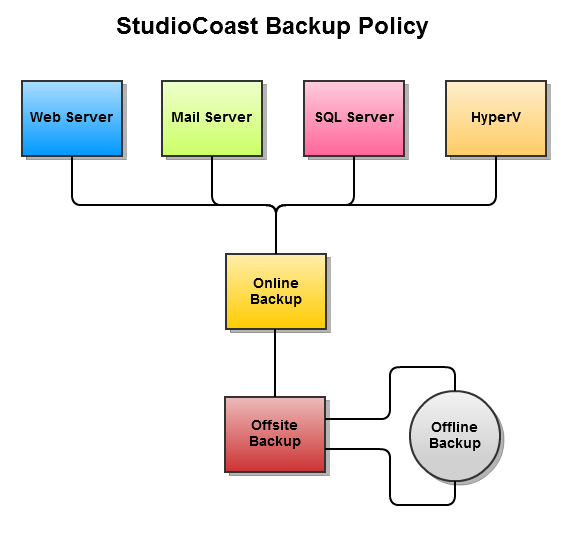 StudioCoast provides a comprehensive backup policy for all of our customers. All of our Web Hosting and HyperVPS plans include complete online and offline backups free of charge. Offline backups are kept offsite for disaster recovery purposes. The diagram below details our setup of no less than three backups of our Web, Database, Mail and HyperV services. Additionally, each server and backup device utilises RAID to protect against hardware failure.